With January providing a rare super blue blood moon eclipse event, a SESDA 4 outreach coordinator made full use of the opportunity to share lunar science with a very curious public. 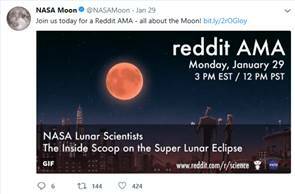 Activities she used for public engagement included news features on Twitter with a twitter feed interaction between @NASAEarth and @NASAMoon and a moderated Facebook Live event which reached 828,100 individuals. Of special note was a Reddit Ask Me Anything session on January 29 featuring Lunar Reconnaissance Orbiter (LRO) scientists which made the home page of Reddit and generated over 1,640 comments.